"A ground-breaking anthology from some of the very best writers in the business today, assembled from the electronic 'pages' of one of the Internet's most valuable resources for intelligent science fiction of high literary quality." In 1997 the infinity plus website was launched to showcase some of the best in SF, fantasy and horror fiction. 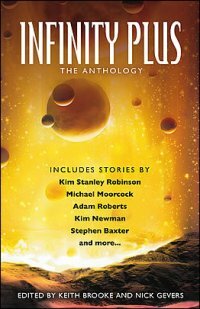 Since then two infinity plus anthologies have been published in fine limited edition hardbacks by PS Publishing - these books featured the work of some of the site's major contributors - stories chosen by the writers themselves, stories dear to their hearts and deserving renewed attention. To mark the 10th anniversary of the site, Solaris are publishing infinity plus: the anthology on 1 August 2007: a mass-market omnibus edition of the two earlier anthologies - 768 pages of high-quality genre fiction by some of the leading names in the field.